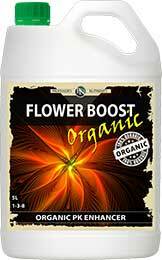 Professor’s Flower Boost is a 100% premium organic concentrated PK flower enhancer. Scientifically formulated to initiate early flowering and node development, Flower Boost provides plants with the perfect ratio of PK to produce a large, high quality yield. Whether you are cultivating flowering or fruiting plants, Flower Boost will give your plants the exact PK ratio they need to release their full potential.